There are very few musicians to whom the label "cinematic" would truly fit - Bruce Springsteen, however, is undoubtedly one. His song-book, create over decades of compositions, has seen the singer create scores of earnest laments of honest men and countless tender-hearted ballads of broken souls; his talent with lyrics and sculpting vast soundscapes has seen New Jersey's most famous son paint some of the most stunning visuals of Americana in art history. It would be fair to say if Van Morrison was the music world's Terence Malick, The Boss would be its John Ford. Yet, rather sadly, Springsteen has spent much of his career avoiding the organic transition into celluloid star - yes, there's been winning concert films and delightful documentaries, a brief cameo in High Fidelity, and classic songs that have inspired countless movies in the way a Robert Mitchum poster gave its name to one of Bruce's most well loved songs. 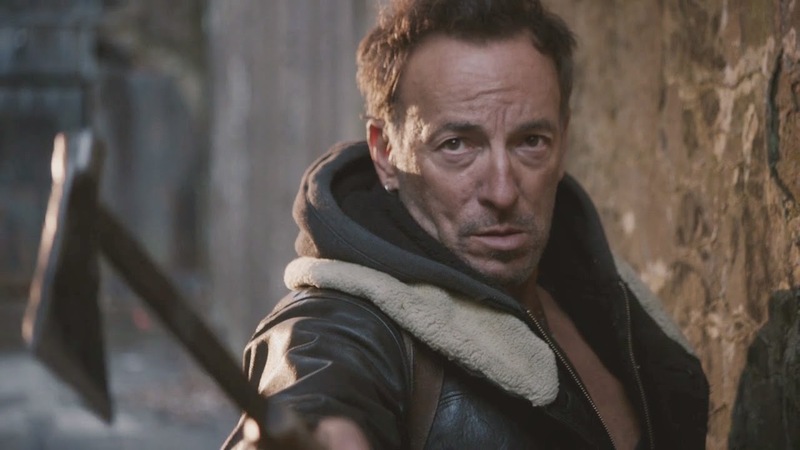 Until now, however, Springsteen has avoided trading his guitar for a seat behind the camera - something the Born To Run singer looks to put right with his directorial debut Hunter of Invisible Game. Unfortunately, and as a huge Springsteen fan I take no joy in saying this, it would seem that the man himself must have been aware of his weaknesses in this area for have postponed what many would have deemed an inevitable career move. Sadly Hunter of Invisible Game, co-directed with Thom Zimny, fails to live up to (admittedly heightened) expectation. The aim - to create a languid and evocative contemporary Western is an admirable one. In execution, however, the project is not quite a success - instead of recalling the visual poetry of Andrew Dominik's The Assassination of Jesse James..., for example, the abstract shots on display add nothing to a linear narrative and, instead, reek of the worst excesses of a student "art" film. That the short "film" is little more than an elongated music video - something which takes us back to the bad old dark days of Will Smith's MV for his Wild, Wild West single - hardly speaks volumes of its achievements. The high points of Hunter of Invisible Game invariably revolve around Springsteen's face - his visage tells a remarkable story. It would be a fascinating development were a skilled director, such as P.T. Anderson or the aforementioned Terence Malick, to cast him as a lead in a future project. Perhaps that's where Springsteen's cinematic future lays?